A biologist was interested in studying how far bullfrogs can jump. 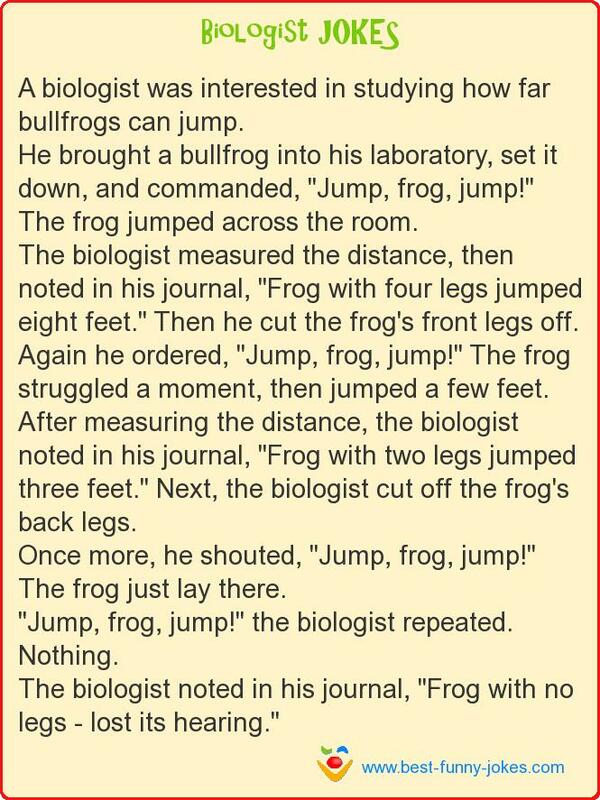 He brought a bullfrog into his laboratory, set it down, and commanded, "Jump, frog, jump!" The frog jumped across the room. The biologist measured the distance, then noted in his journal, "Frog with four legs jumped eight feet." Then he cut the frog's front legs off. Again he ordered, "Jump, frog, jump!" The frog struggled a moment, then jumped a few feet. After measuring the distance, the biologist noted in his journal, "Frog with two legs jumped three feet." Next, the biologist cut off the frog's back legs. Once more, he shouted, "Jump, frog, jump!" The frog just lay there. "Jump, frog, jump!" the biologist repeated. The biologist noted in his journal, "Frog with no legs - lost its hearing."